Father Bede welcomes you to our parish website. 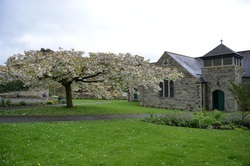 Our Lady and St. Benedict Catholic Church in Ampleforth is a part of the Diocese of Middlesbrough and is served from Ampleforth Abbey. To keep current members of the parish community informed about all aspects of parish life and secondly to be a point of contact and welcome for people searching for a Catholic Church in this area.